By Melissa Lennig on December 22, 2013 7 Comments. This content contains affiliate links. As an Amazon Associate I earn from qualifying purchases. 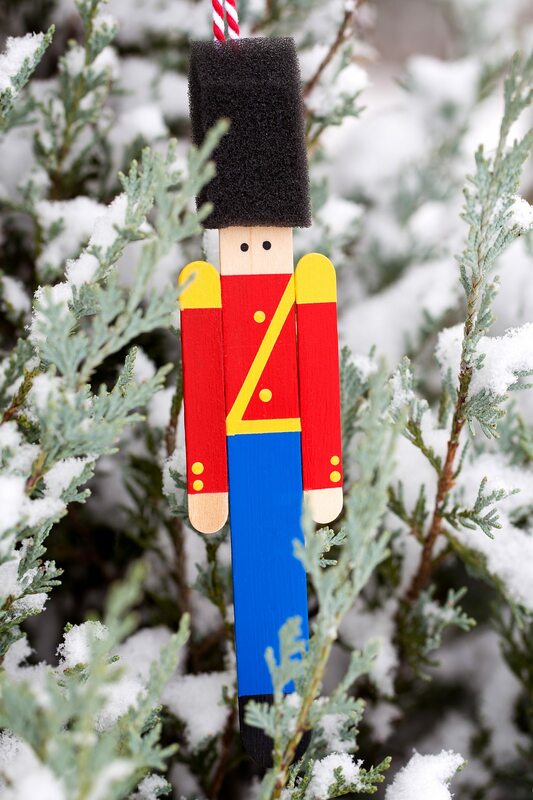 Crafters big and small will delight in making a Popsicle Stick Toy Soldier Ornament with craft sticks, paint, and one extra unique craft material. Read on for the full tutorial! Do you hear what I hear? It’s the happy sound of children cheering for winter break! There may be a teacher or two joining the chorus, but it’s mostly the joyful song of children anticipating Christmas. This morning, the boys and I settled around our kitchen table to watch the snow fall through our window and to create some last-minute Christmas ornaments. 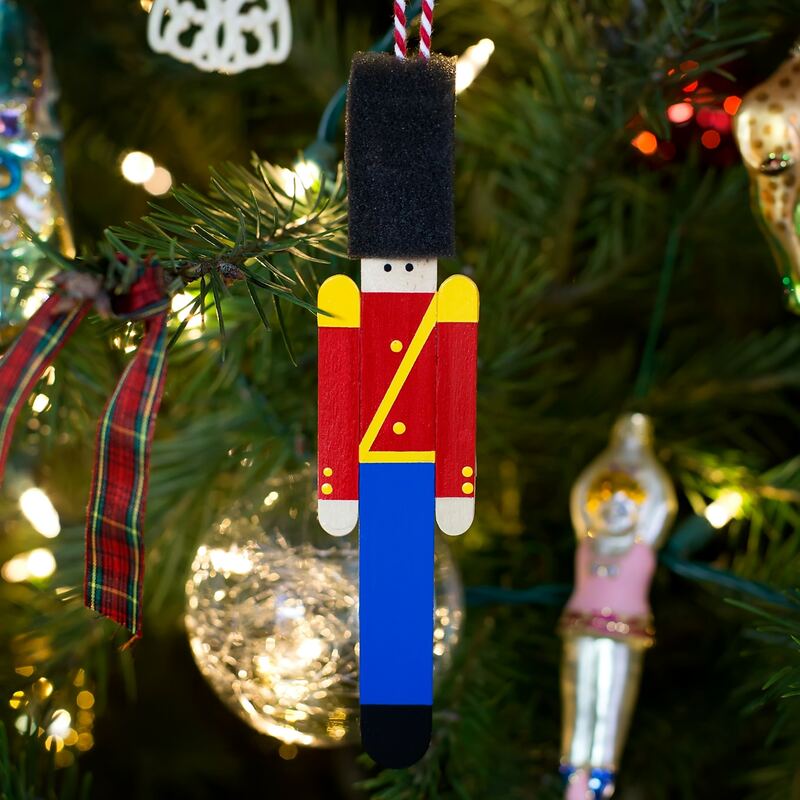 Our Toy Soldier Ornaments are colorful, simple, and quite festive. 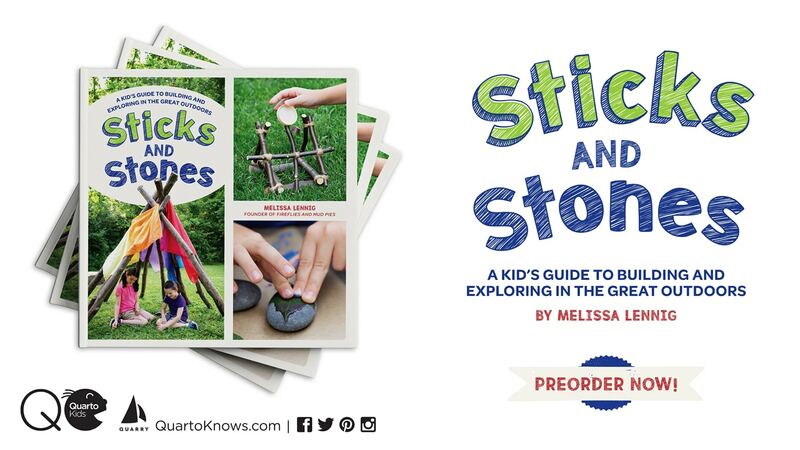 We hope you like them just as much as we do! 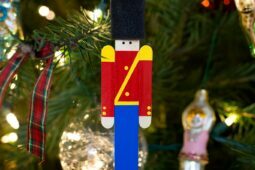 Crafters big and small will delight in making a Wooden Toy Soldier Ornament with craft sticks, paint, and one extra unique craft material. 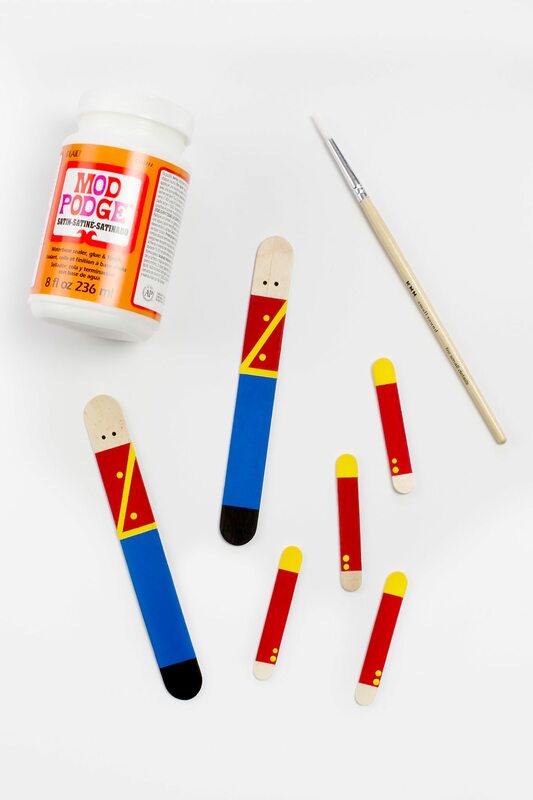 Invite kids to use the blue, red, and yellow paint to make a toy soldier uniform on the wide craft sticks. Use washi tape to create straight, clean lines. Use the end of a paintbrush dipped in yellow paint to make buttons for the soldier’s uniform. 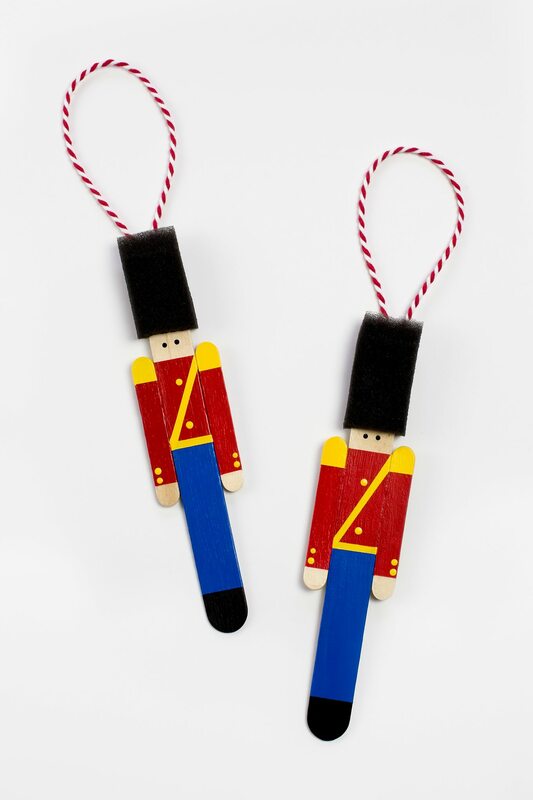 Use red and yellow paint and mini craft sticks to create arms for the toy soldier ornaments. Dip the end of a small paintbrush into black paint to make eyes for the soldier ornaments. When all of the painted pieces are dry, seal the ornaments with Mod Podge. Glue all of the ornament pieces together with tacky craft glue or hot glue. Squeeze a small drop of glue inside of the sponge tip, then slide the sponge onto the toy soldier’s head. 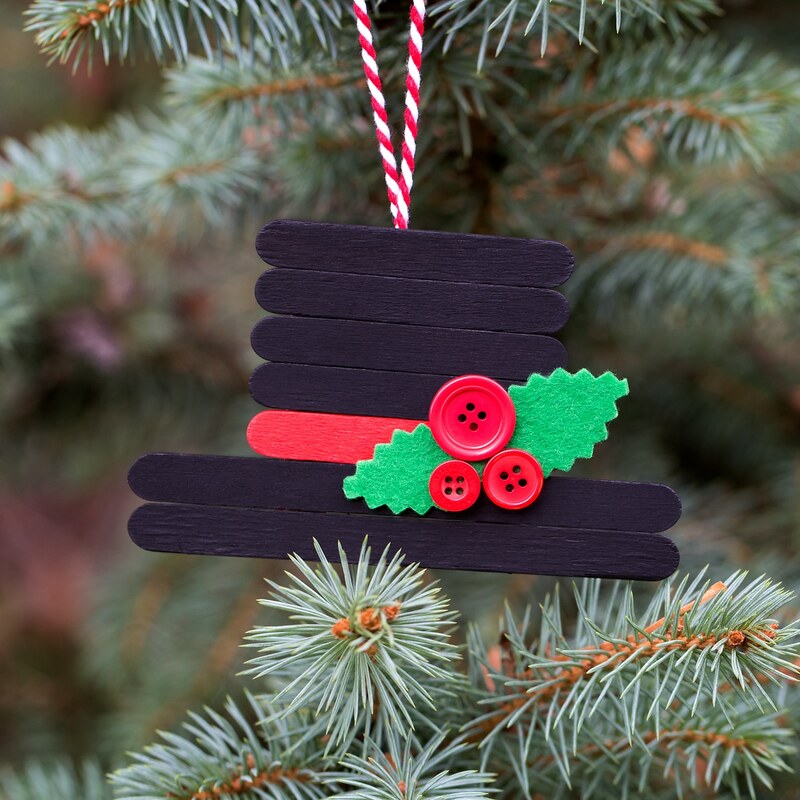 Last, attach a loop of twine to the back of the ornament using the hot glue. 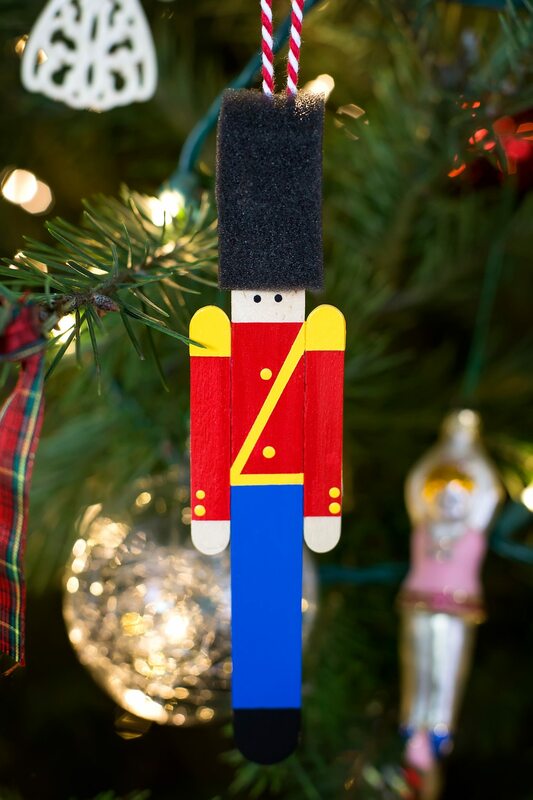 Your popsicle stick toy soldier ornament is complete! 1. 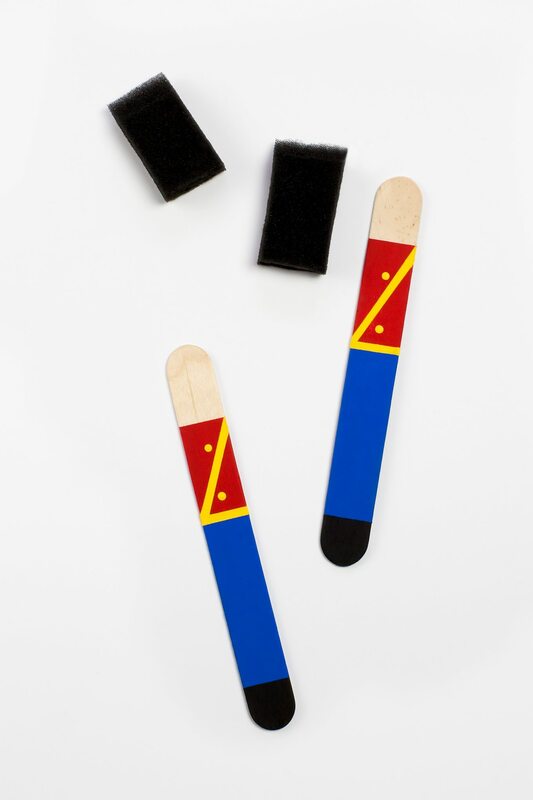 After gathering supplies, invite kids to use the blue, red, and yellow paint to make a toy soldier uniform on the wide craft sticks. I used washi tape to create straight, clean lines…but that step isn’t absolutely necessary. 2. Use the end of a paintbrush dipped in yellow paint to make buttons for the soldier’s uniform. 3. 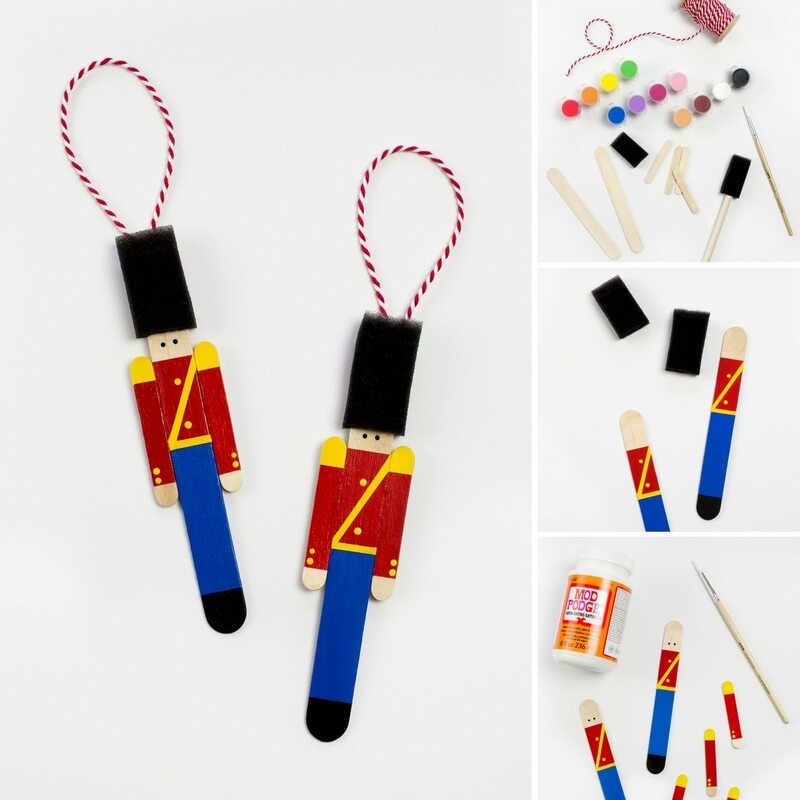 Use red and yellow paint and mini craft sticks to create arms for the toy soldier ornaments. Dip the end of a small paintbrush into black paint to make eyes for the soldier ornaments. 4. When all of the painted pieces are dry, seal the ornaments with Mod Podge. 5. 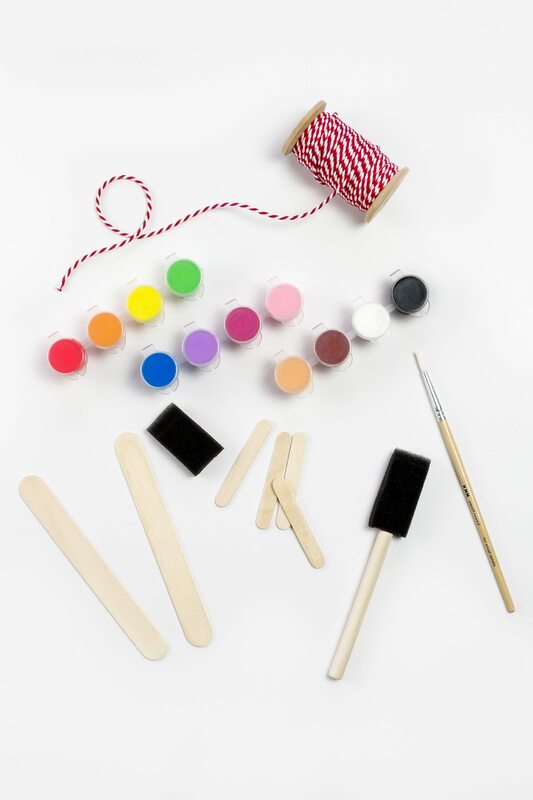 Glue all of the ornament pieces together with tacky craft glue or hot glue. TIP: I secured the body and arms on the back with a small piece of washi tape in addition to the glue. 6. Squeeze a small drop of glue inside of the sponge tip, then slide the sponge onto the toy soldier’s head. 7. Last, attach a loop of twine to the back of the ornament using the hot glue. Hang and enjoy! 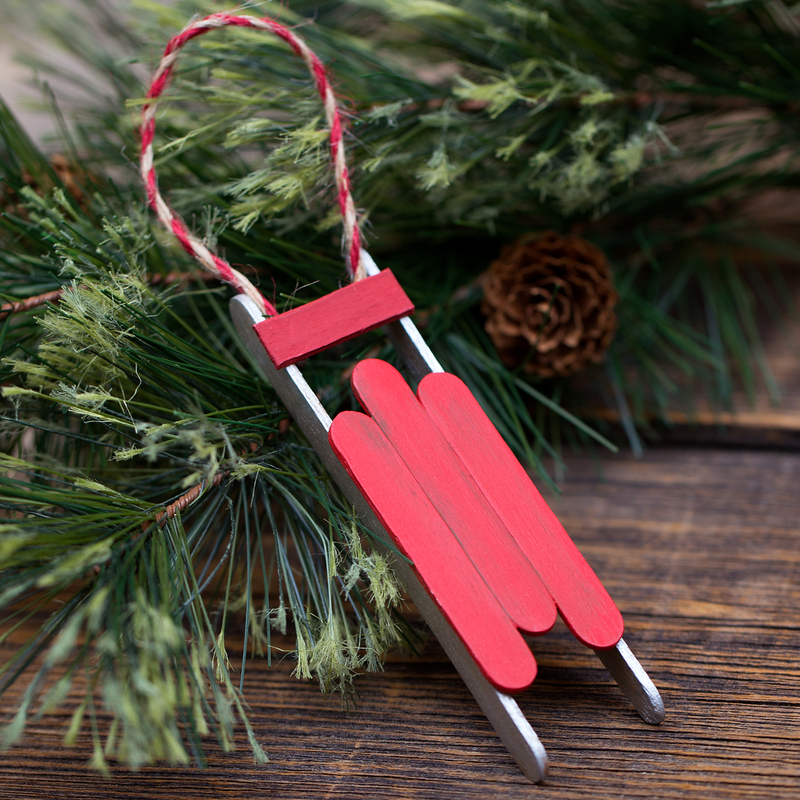 Click the images below to view more Christmas ornaments made from craft sticks. I will do this craft at a retirement home I visit once a week. Thanks for your ideas.